Creating your kitchen style is much like shopping for clothes. As you browse, you find yourself drawn to certain elements or details that just speak to you. Of course, trying on clothes is much easier than trying on kitchen styles. Those are much more permanent. That’s why exploring these different options through pictures and descriptions can be so helpful in creating your ideal kitchen. Do you like a touch of old-world charm? Perhaps a traditional kitchen is your style. The details of this style can be found in the architecture with elements like arches and crown molding. These architectural details can be extended into the cabinetry by incorporating legs into the lowers and pillars on an island. The cabinets themselves would be flush inset or framed unlike more contemporary cabinets. The look of the hardware, such as the knobs and hinges, add to this feel and are usually silver, oil-rubbed bronze or antique brass. When it comes to countertops, marble is an obvious choice, in addition to butcher block, quartz and granite. More old-fashioned character can be brought in with ornate light fixtures and chandeliers. Try incorporating antique pieces as well, either with a china cabinet, hutch or eat-in kitchen table set. It can be easy to confuse classic and traditional kitchens. But if you compare it with clothing, a traditional kitchen is your grandmother’s wedding dress, whereas a classic kitchen is a good pair of jeans. It’s simple and clean and appeals to many people. You’ll often find lots of white in a classic kitchen along with simple architectural details. You can break up the amount of white with a simple black countertop in granite or quartz. It’s mostly a neutral palette, but every homeowner can introduce elements of colour to reflect their personality and style. The flexibility of this style makes it a favourite for many new homeowners. This style of kitchen can be tough to define as it’s often confused with contemporary. Mostly, modern kitchens are considered sleek with strong lines. Cabinet doors are flat with no detail and they’re often frameless. Picture an Ikea kitchen, more or less. Everything is fairly simple, including the hardware. You won’t see any patterns in a modern kitchen as they lack ornamentation. This aesthetic can appeal to those who love a clean look to everything. The minimal amount of detail allows the beauty of the natural materials to shine through. Industrial elements are also apparent in many modern kitchens. While modern and contemporary kitchens share certain elements, a contemporary kitchen will play more with current trends and patterns. The appliances are often the stars of such a kitchen and are usually high-end. Pops of colour may feature as well, either through the backsplash, accessories or countertops. Here’s where a little bit of ornamentation can define it as a contemporary kitchen. A unique choice in lighting or seating may be that added bit of detail you wanted. This is a kitchen where you can include different materials like wood, metal and stone all in one place. 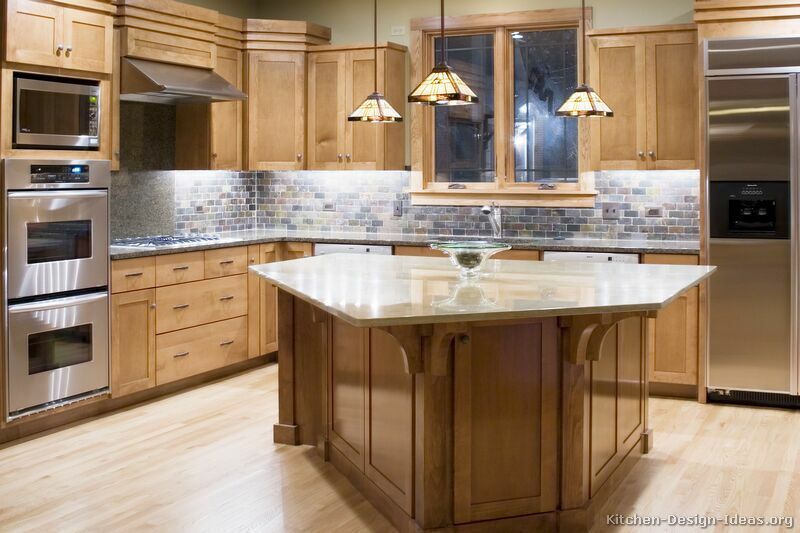 If the thought of a modern kitchen leaves you feeling cold, then maybe a warm craftsman kitchen is right for you. This style is wholesome and comforting. There’s an emphasis on warm, rich wood, be it in the cabinets or floors. There are simple artisan details in the craftsmanship of these details. Often a lot of earth tones are incorporated into this style. When it comes to lighting, you may want to choose simple fixtures with geometric elements for detail. Tiffany lamps also suit this style very well. The craftsman style is often noted for the nooks and crannies built into the space. A breakfast nook with built-in seating would suit a kitchen like this very well. Just as there are many styles for choosing an outfit, there are many more styles for your kitchen. Odds are you already know what style speaks to you. And with that knowledge you are well on your way to your dream kitchen.